• Tax Day 2019 is Monday, April 15. 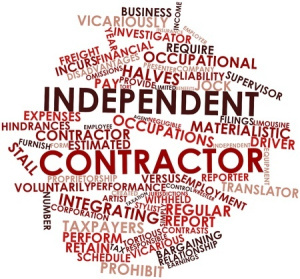 • If you work as an independent contractor, you are entitled to certain tax deductions for your business expenses. • Even if your contract work is just a side gig, you're still running a business, so it's important to track your expenses. • We spoke with CPA and certified financial planner Harvey I. Bezozi about the deductions that independent contractors can use to reduce the amount of tax they owe. With the rise of the gig economy, many more people now have to consider the tax implications of working as independent contractors. When you are an independent contractor, the IRS considers you a business owner, even if you contract full-time for one client. Independent contracting comes with additional tax burdens (e.g., there is no employer contribution, so the entire payroll tax burden falls to you). On the other hand, you can deduct expenses that you couldn't take as an employee. Harvey I. Bezozi, a CPA and CFP, has worked with small businesses for more than three decades. He shared with us this list of tax deductions that every independent contractor should know about. Before he talked about deductions, Bezozi said, "When somebody starts a business, especially if they're new at it, they'll usually become a sole proprietor. That's mistake number one." He suggests that you form an LLC, S-corporation, or some other business entity, even if your business is very small. He believes that the tax benefits and the protection from personal liability are worth the extra paperwork. As an employee, your work commute is not tax deductible. "But as an independent contractor, it's no longer a commute," Bezozi said. If you're going from your office to your client's office, keep a log and take your mileage off your taxes. You can also deduct transit expenses for travel to a client. "There's no reason why you can't deduct that portion of the apartment and/or home expenses, based on square footage" that you use for a home office, Bezozi said. To be deductible, your home office "has to be regular and exclusive use and your principle place of business," he added. The cost of any electronics you use in your business can be written off on your taxes. If a device has mixed personal and business use, your deduction is proportional. If 30% of your phone usage is for business calls and emails, you can deduct 30% of the cost of the phone and your monthly bill, Bezozi said. Bezozi also noted that if you're super conscious of cyber security, you might want to have separate devices for personal and business use, especially if you have employees. "Generally, you want to have some kind of professional liability insurance," Bezozi said. "You may want to have cybersecurity insurance. Eventually you want to have disability insurance. That's something that people don't think about." All these insurance premiums are deductible. If you work alone, your health insurance premiums might be deductible, under the same IRS rules that govern the deductibility of healthcare expenses for individuals. If you work as an independent contractor an IRA, SEP IRA, or solo 401(k), will allow you to defer taxes on that income until you retire, Bezozi noted. The amount you contribute comes off your taxable income. "Most people that start out in business, especially in the gig type of economy, are going to be looking to meet people," Bezozi said. Whether you go across town to a networking event or across the country to a professional conference, your travel expenses can be deductible. "When you meet a client, if you have a meeting over coffee or lunch or a fancy dinner, you can write off the cost of half of that meal," Bezozi said. The tax rules have changed, however, so your non-meal entertainment expenses are no longer deductible. "If you take a client to a concert, you can no longer deduct that," he noted. "Anything to make you better and more knowledgeable in what you do now" is deductible, according to Bezozi. The training must be "something that enhances your ability in your current career but doesn't get you ready for a different career," he added. He noted that subscriptions to professional magazines and apps and software that you use in your business are also deductible business expenses. Gifts to your clients are deductible, up to a point, Bezozi said. If you send a year-end gift basket to an individual client, you can deduct up to $25. If the gift is for the company as a whole (a coffee table book, for example), the limit is higher. If you charge business expenses on a credit card, Bezozi said, "the portion of interest that relates to business expenditures can be deductible." He noted that there is a limit to the deductibility of this interest, but the limit is high enough that it won't apply to most independent contractors.